Having already published a few posts these last few days ("Curse of the Heterodoxy" and "How an Aussie Summer Disappears") I had planned to wait a while before unleashing new versions of my wraths and rants. But then Gerald Friedman's research on the economic effects of Bernie Sander's proposals went viral, Krugman went bananas (see here, here and here) and the entire blogosphere started discussing multipliers and (un)reasonable assumptions (see Cochrane, Romer & Romer and Sumner). For a great take on the spectacle, listen to the latest episode of the ContraKrugman podcast - or Murphy's article at the Independent Institute. On we go then. 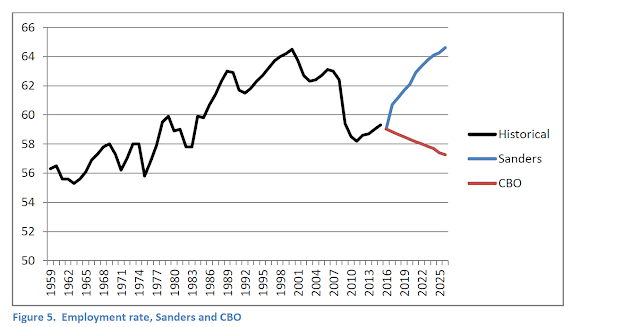 Gerald Friedman, a post-keynesian professor at UMass Amherst analysed the Sanders proposals through what seemed to be standard models used by the CBO and CEA (Council of Economic Advisors). The gist of the story: if you have big inputs and positive multipliers, you'll get big results. As a matter of fact, 5.3% real GDP-growth over the next 10 years, growth rates unheard of for decades. My first reaction: are you telling me that after increasing social security expenditures, pensions, taxes on employment and pretty much every incentive available for people not-to-work, they will come running back to the labour market? Hm, don't think so. And all these people whom nobody wanted to hire since the recessions of 2001 and 2007 (p. 14, specifically) are now flooding into the labour market and all will find employment at wages significantly above what they could not be employed at before - and that this will drive productivity? At twice the rate CBO estimates, for ten years? Seriously? How is it even reasonably conceivable that the least productive members of society will drive productivity growth at twice estimated rates while paid well-above current wages (and so reducing productivity figures)? To convince anyone, you'll need a lot more than reference obscure Kaldor-Vendoorn effects and unicorn-like increasing returns. Let's dig through more of Friedman's crazy paper. A whopping 74% of the impact, according to Friedman, would come from the Medicare-for-All program, or roughly $10,7tn out of the $14,5tn spending allegedly comes from Medicare plans. We'll have a look at the details later. Problem is, most of the other programs are not actually spending increases; the Climate Change section involved a carbon tax designed to increase prices of carbon-using activities, rebated by 83%, so the net increase in spending is only a fraction of the $1,2tn. Same with free tuition ("College for All") where the current university grants are abolished, and students no longer take on debt for funding their tuition - which doesn't amount to additional spending, since students were previously spending that money out of future income. If the government takes over expenditure from the private sector, that is not fiscal stimulus, it's simply reshuffling (not even a case of textbook "negative taxation multiplier is lower than positive government spending multipliers"). The biggest discussion in the media revolved around Friedman's use of (admittedly very moderate) multipliers ranging 1.25-0.83 - significantly below multipliers used by Romer for instance in calculating fiscal stimulus effects. To be fair, for the infrastructure expenditure he uses multipliers of 1.5. There is however a whole lot more juicy stuff in his paper. He cites the measure-of-fit of that statistics as R2 =0.19, and pretends that's enough evidence. Besides the methodological issues, the assumption that the same will apply henceforth and that the US (or the world) of 1960s and 1970s is comparable to the US of today, the problem of way too low R2-value eludes him and he bases his entire prediction on that regardless. He estimates that the total effect on wages over 10 years coming from the Minimum Wage hikes amount to $1,952tn, or roughly $200bn per year. Let's work through the logic for some impacts here (that Friedman's model does not seem to take into considerations) and for simplicity average the entire effect to -0.15, and pretend the minimum wage is $10/h already. That is, these back-of-the-envelope calculations understate the actual effect. The wage increase (from $10/h to $15/h) is 50% (15/10 =+50%) and so the negative labour demand effect is 0.5 x 0.15 = 0,75%. Out of the third or so that currently work for under $15/h (some 33 million americans), 7,5% of them (or 2,5 million) will now be unemployable as a result. 2,5 million of the lowest-earners. But let's move on to some even worse considerations. At least, for the Minimum Wages he admitted there would be a negative employment effect - whereas the proposed Payroll taxes received no such consideration - despite being three times bigger! 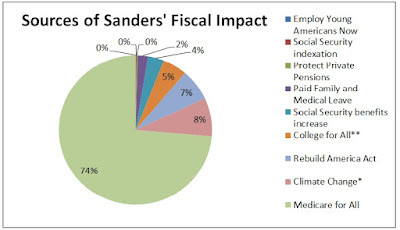 Among Sanders' proposition is a 6.2% general payroll tax in order to fund Medicare (the single-biggest revenue source, some 40% of Sanders' additional funding; some $630bn/year according to Friedman), another 2.2% payroll taxes on households and a 2x0.2% payroll tax in order to fund paid family leave (half payable by employer as a regular payroll tax, the other half constructed as an income tax) - adding up to 8.6% payroll tax across the board. Payroll taxes have partly the same effect as minimum wages, since they artificially increase the cost of labour for the employer; from the employer's point of view it is irrelevant how large part of the expense paid in wages go to the taxman and what is left in wages - the total cost matters. Despite having an effect three times the projected Minimum Wage there is no discussion of a negative employment effect! Besides, the numbers don't even add up; 6,2% payable by employers x all wage incomes of around $7.7tn = $480bn, not $630bn. We'd have to increase current wages by some 30% before that happens. The other 2.2% in payroll taxes are supposed to yield some 2.1tn, or $210bn per year, overstating the actual number by similar magnitudes - again, this is assuming absolutely no negative employment effects from these massive tax increases. Good luck with that. Let's move on to the real magic. 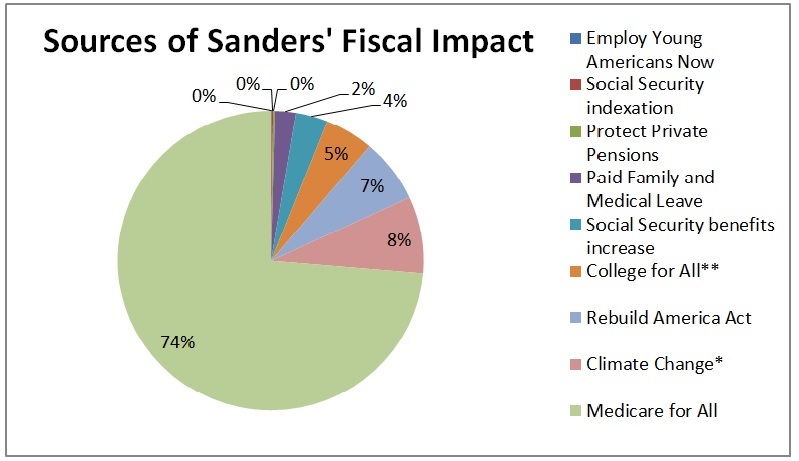 Almost $11tn dollars over 10 years, or around 1 000bn/year of Sanders' "Stimulus" is coming from the medicare program. How does this work for Friedman? "that competitive labor markets will lead employers to pay in higher wages a growing share of what they would otherwise have paid in health insurance premiums, increasing incrementally from 10% in 2017 up to 90% in 2026. " Say WHAT? When did the Federal Reserve's dual mandate and setting interest rate have anything to whether or not the Treasury is running a deficit? "The type of economic redistribution proposed by Senator Sanders could be undermined by behavioral changes. Rising wages may lead to reductions in employment and declining business investments. (p.22)"
Friedman wrote a somewhat technical paper, trying to estimate complicated macroeconomic effects and run through the impact of Senator Sanders' proposals. It involves countless errors ranging from the model itself, theoretical and methodological issues, reasoning, conclusions and even the arithmetic errors Professor Cochrane was concerned about. My post gave you a tiny insight into exactly how absurd and crazy this contribution is. The critics of Krugman & the CEA economists, saying that Friedman used the same model they use, are seriously mistaken. Even if the initial model is influenced by standard mainstream models, it is blown to oblivion by Friedman's absurd assumption and out-of-proportion reasoning. P.S. When I run through the calculations using Friedman's data and multipliers, I find nominal GDP in 2026 18% higher than the CBO projection - nowhere near Friedman's figures of 50% higher than the CBO projections. Something is indeed fishy.